One of the first visits I ever took to the theatre was with my parents to see The Wizard of Oz. It was at the Thameside Theatre in Grays, I was around 8 years old and I can remember being oh so excited to see the characters and hear the songs from the iconic MGM film that I would sit and watch with my dad every Christmas. Trouble was, Dorothy didn't look like Judy Garland, she had really short hair; and despite a valiant effort, none of the other characters looked remotely like they did in the film. Huge disappointment all round. Little Theatre Company's stage version of the film dubbed 'the most magical adventure of them all, holds no such disappointments. This stage version encapsulates pretty much every nuance of the film and its characters and contains all the much loved songs from the Oscar winning movie score plus, for good measure, an extra number that was cut from the film, Jitterbug. Dorothy Gale and her little dog, Toto, find themselves in Munchkinland in the Land of Oz after a tornado rips her house from Kansas and lands slap bang on top of the Wicked Witch of the East. Her sister, the Wicked Witch of the West shows up to claim the ruby slippers from her sister and swears revenge on Dorothy for her sister's death but Glinda the Good Witch transports the witch's ruby slippers on to Dorothy and sets her off on the Yellow Brick Road to find the Wizard of Oz in order that she can find a way to get back home. Along the way she befriends a scarecrow, who needs a brain, a tin man who has no heart and a cowardly lion seeking some courage and so they all set off to seek the Wizard's help. 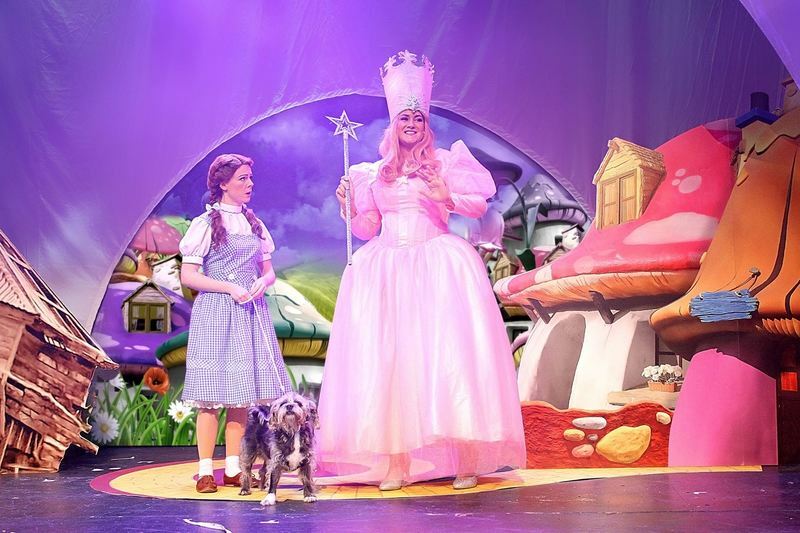 To say that Little Theatre Company's production of The Wizard of Oz is ambitious, is an understatement; Director, Tim Cater, has gone all out on every opportunity to make this show as true to the film as possible. There is an effective use of projection to show backdrops such as the farm, the 'twister' tornado, Oz and the witches castle and just like the film, there's that magical transition from black and white (in actual fact, brown and white) to the world of colour when Dorothy lands in Oz. I love that Dorothy's dress changes colour too. There was an audible gasp from the audience on seeing the set transform into Oz after the tornado scene. This show has been very well cast with Laura Harper playing Dorothy as true to Judy Garland as ever I've seen. Somewhere Over the Rainbow​ is a tough song to start off on and can be overplayed, but Laura gives us a nicely sung gentler version. Kilian McIntosh is a newcomer to LTC but with some impressive credentials on his bio. He is perfect as the straw-filled Scarecrow, as too is Dave Gardner as the Tin Man. Providing some true laugh out loud moments is Julian Cottee playing the Cowardly Lion, giving a lovely endearing performance. The King of the Forest song is a tricky one, but Julian does a good job with it. It's always going to be a big ask to cast enough munchkins for this show and here these are made up of children and the LTC ensemble who, no doubt, will probably have a few sore knees by the end of the run. I loved the Lollypop Guild munchkins - very funny. The Wicked Witch of the West gives Lianne Larthe the opportunity to go green and ham it up big time. Kate Andrews as Glinda is every bit the essence of the good witch in a wonderful puffy pink dress. Chris Higginson also gives a nicely convincing and comical performance in his role as the Emerald City Guard. One of the highlights of the show is when we first meet the impressive 'Wizard'. Without giving away any spoilers, this is one heck of a creation from Steve Park. The other 'little' star of the show of course is Eddie the very cute pooch playing Toto, Dorothy's pet dog. Eddie is quite clearly a natural on stage, even though he did almost give Dorothy the slip at the end of the opening night! Song favourites such as Follow the Yellow Brick Road, We're Off to See the Wizard, If I Only Had a Brain/Heart/the Nerve and You're Out of the Woods are all in there, accompanied by the 10 piece orchestra, conducted by Paul Smith in his first time role as MD, also doing a fine job. Emma Birch has contributed some simple but effective choreography throughout. With this production in particular, however, every person who has been involved with the making of the costumes is the stand out star and deserves a mention: Carla Cater, Joan Hubbard, Chantal Paul, Ann Cullender, Julie Robertson and Pat Wood have all contributed to make the most amazingly fabulous costumes which are almost as identical to the costumes in the film and along with Make-Up and Hair Co-ordinator, Jenny West, a super huge credit must go to these 'behind-the-scenes' talents. 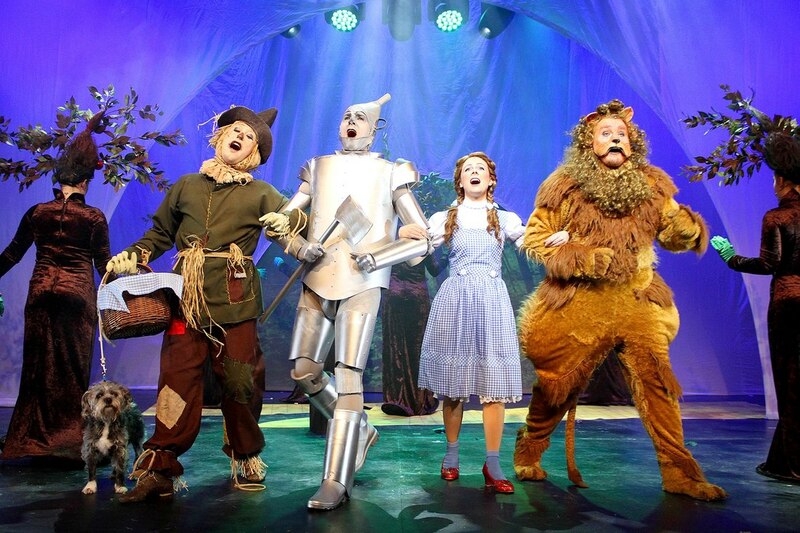 If, like me, you are a big fan of the film and want to see it come alive on stage then you won't be disappointed with Little Theatre Company's production of The Wizard of Oz.